Do you have Spring Fever as badly as I do? OMG, what a LONG Winter, right? Well, what better way to dive into the Spring state-of-mind than a beautiful...and affordable...nail polish collection from SinfulColors. I had a chance to try out 5 shades from this gorgeous new collection. Let me tell ya'll, it was so hard to pick a shade from all of the amazing choices. 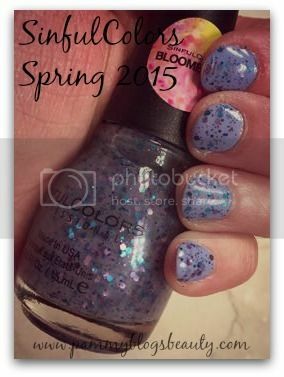 The Spring Fever SinfulColors Spring 2015 Collection is a comprehensive assortment of 24 bold, vibrant, and even unexpected colors and finishes. From soft pastels, to shimmers and glitters, to calm blues, purples, and teals, and even iridescent toppers, this collection really can perk up your Winter-weary nails! Begone the blah shades of winter, it is time to bring in some color! Cream Pink (Bubble Gum Pink): This exact shade of pink tends to be my polish shade go-to. What can I say, I am a "pink" girl at heart and nothing does it better for me than a bright Barbie pink! I think that this will be my perfect pedicure shade for the Spring and Summer! I literally just feel happy even looking at this color! While it has a shine to it, it dries to almost a matte finish (demi matte?). Really pretty! Sail la Vie: (Cerulean Sea Blue Creme with glossy finish): This gorgeous cerulean shade is another favorite color of mine. Can I even tell you how many shirts I have in this exact same color? lol, maybe it is because it matches my eyes. Anyways...it is a shade that I just LOVE wearing on my tips! It is a fun way to wear blue without your nails screaming "I am blue" (ha ha, if that makes sense). I really like it topped with the "Petal be the Day" Specialty Glitter. What a fun combo. My nails make me smile when I wear this combo. :) Seriously, it is on my tips now and I am diggin it! Petal Be the Day: (Royal Blue and Purple Confetti in a sheer lilac base): This is a super fun glitter. I do wish that the sheer lilac base showed up just a tad more and that the glitter was more full coverage. But still, even with that critique, I love wearing this as a topper. It is really too sheer to wear on its own with its sparse glitter. 2 coats give you a decent amount of glitter. Flower Power: (Baby Pink Speckled with White & Fuchsia): This is honestly the item in this collection that I anticipated the most! It really is a unique polish/topper! I love the round and chunky shape of the white and fuchsia glitter. The baby pink polish base is dense enough for good coverage and the glitter seems to go on a bit fuller (yet not full coverage by any means) than the Petal be the Day. This is so pretty on its own for a mani! So fun!!! Do you know what is the most amazing part about this collection and all SinfulColors polishes in general? They retail for only $1.99 and are available at your local Walgreens! At that price, you can afford to get all of them that catch your eye! :) Plus, the quality, coverage, and wear (4+ days with only very slight tip wear for me...and I am hard on my nails with constant hand washing and diaper changes) are amazing! I haven't tried any polishes from this brand - it sounds great! All the shades are so pretty specially Flower Power and Petal be the day.